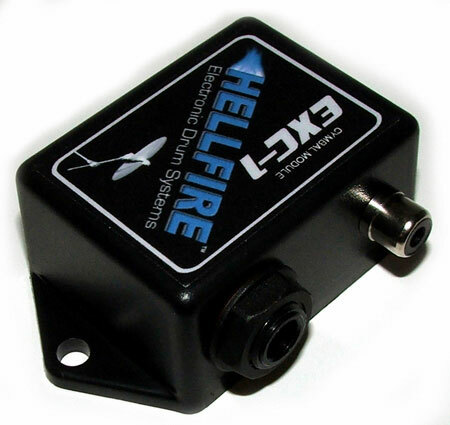 Welcome to the Hellfire Electronic Drum Systems Store! We at Hellfire want to help the eDrum DIY’er as best we can. We thought, what better way to do this than by opening a store. Some of our items will be products to make the DIY process easier, while other product may be complete kits and/or finished eDrumming products. Please check back from time to time to see what’s been added. Thanks for looking! SHIPPING IS ONLY AVAILABLE IN THE UNITED STATES, US VIRGIN ISLANDS, AND PUERTO RICO. 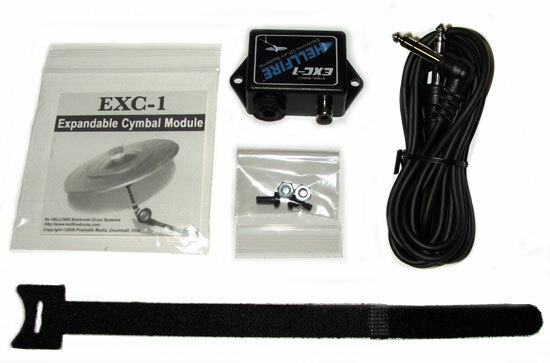 The EXC-1 Cymbal Module was designed for the Do-It-Yourselfer. Add this module to any 10”, 14” or 16” practice cymbal to transform it into your own custom electronic cymbal. Just drill two holes in the cymbal, using the included template, and attach to the cymbal with the included hardware. For the more advance DIY’er the EXC-1 has one advantage over most other do it yourself options and that is, it can be expanded. When you are ready, you can add a choke switch, choke/2nd zone switch, or just a 2nd zone piezo (subject to the module you are using). Just think of the money you will save doing it yourself. And for a limited time, a ten foot TRS instrument cable (a $9.95 value) is included for FREE! SOLD OUT! PLEASE EMAIL IF INTERESTED. 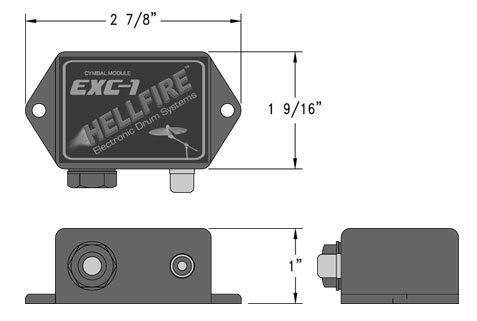 Please note that Hellfiredrum.com does not currently sell choke switches and/or extra piezo elements that would be used for a second zone. The inclusion of the expansion port on the EXC-1 is meant as a way for DIY’er to further explore the use of the EXC-1 Cymbal Module and does not imply that any specific instruction exist on how best to add these extra features. That is being left up to the DIY community to handle. 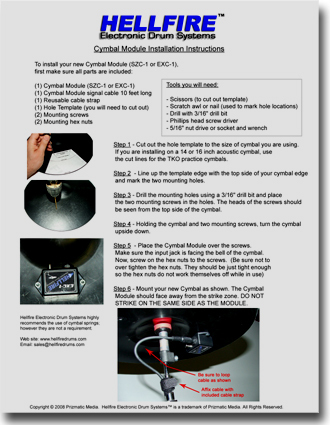 If you are looking for more information on adding a DIY choke switch, please look at this article Get a Choke Hold (eCymbal Choke Switch) as it is a good starting point. Currently I don’t have the exc 1’s for sale as I have none in stock. I most likely will not have any in stock until spring or later. Sorry I couldn’t help. Currently I am not doing the upgrade, but repairing a DM10 single zone pad that I recently acquired. What change did you make in the upgrade that allowed you to remove the resisters from the circuits? If I am just repairing this pad, that is replacing the piezo, then the wiring and then the jack if necessary could a bad resister be my problem. The actual issue is just that I am not getting any signal from the drum.Yes I could troubleshoot with another pads parts but this pad is kind of an extra so I am not down without it, and I would prefer not to damage the ones that are working, as they have been abused by their previous owner. Anyway, I am just wondering if I can remove the resisters from the circuits in my scenario and if not could you point me to the wiring diagram for the jack. I know its here somewhere but cannot find it ugh. Sorry for the long post. Thanks so much for the videos and everything on the website. If you get a chance you might want to check out http://www.DMdrummer.com as well. It’s a forum site that I started just for Alesis edrum users. I hope that helps. Actually I can ship to Canada. I just never updated the site since I’m not currently selling the Cymbal modules. If I do sell them again, I would have no problem shipping to Canada. I hope that helps. Do you know where I can get Alesis Piezo trigger. I been having a back and forth with Alesis about my Alesis DM 10 faulty trigger. They are pulling the warranty card and just want to move and fix my bass drum trigger. Thanks for all you informative dialogue and vids!!! The easiest way to get a new Piezo is to get one from Radio Shack. It is sold as a Piezo buzzer at the store. Search youtube on how to get the Piezo element out of the case to use in a trigger. I hope that helps. I’m interested in obtaining, and/or building a better hi hat for my Roland TD 8 set up. Could you please give email and help me select the right products to make this happen. Ddrum DD1 Electronic Drum Kit, NEW!